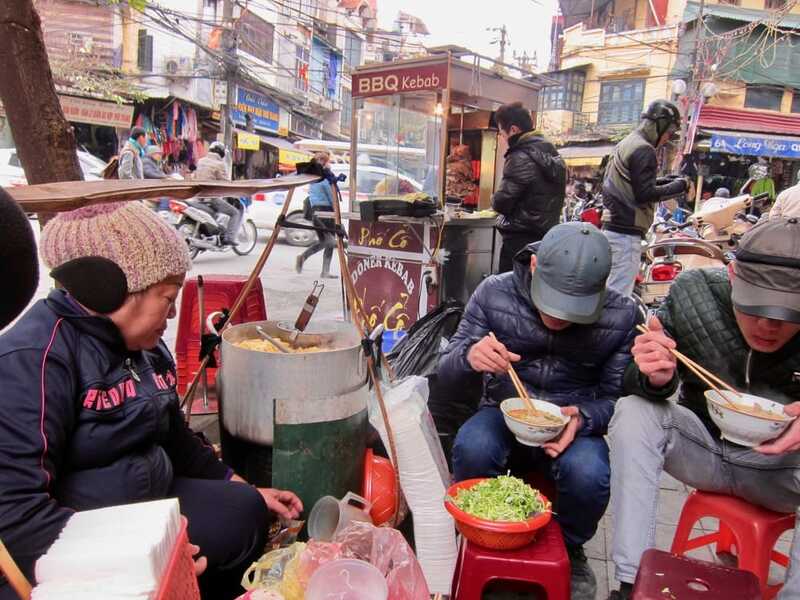 In Hanoi, every corner has a Grandma making soups (pho) of every description and the glorious scent announcements waft through the winter's misty air. But, that's just the beginning. Custom made sandwiches created with a Michelin 3 star flair. Donairs that make the basic middle East idea into a Walt Disney Fantasy. Noodle dishes with bits of beef, chicken and loads of greens with an optional shot of chili that blew the hairs out of Grumpy's ears. Lunch doesn't always have to be in the Metropole. Grumpy, when he is able to get out of his office chair, sometimes takes a walk and one of his favourite lunch stops is the Egg Lady's street stall. Here, he can have a cooked-in-front-of-your-eyes egg sandwich for fifty cents. Egg omelet with lots of greens on a French baguette. Knowing Grumpy's palette, I will suspend judgment on quality. Store space costs money. Street space is cheap and al fresco dining on a ten inch high stool, 20 centimetres from the motor bikes, is truly a great experience. If you haven't yet tried Hanoi street food, you have missed a truly tasty experience. ​Earlier, she has already cooked the pork so when customers come these are ready. She has her kitchen right on the street and nobody minds. She has a cozy corner where her small stove is live with coals all the time. 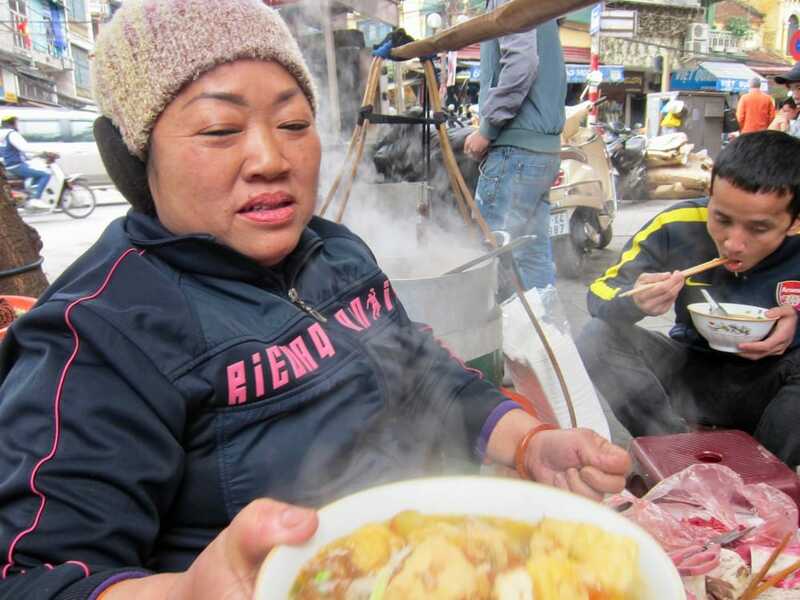 On those wintry days, this soup is the best after hours of walk in the Old Quarter of Hanoi. This is one of our favourite corners as not only is there soup here but also donair. The Donair guy is just setting up at the back. This big bowl of soup will fill you up. You can see the broth boiling at the back. In the picture is also the bamboo sling she carries on her shoulder with everything she needs for that soup. But our Lady chef comes well made up as you can see. There are often more than 10 people crowding around her. Helpers come around to wash the bowls. You just pray to all the kitchen gods to keep your stomach warm and able to enjoy this. Steaming hot, I feel safe eating it. 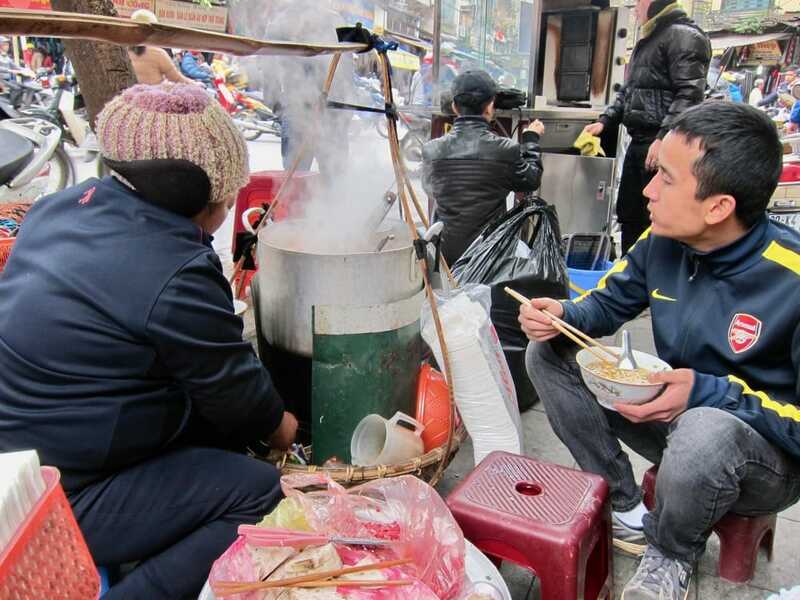 While enjoying your soup, you have the action in the street to entertain you and there's so much action. But passers by will not dare disturb your slurping that soup. They go around you, walk in the road and not even look at you. This is such a day to day thing here in Hanoi. At lunch time, just walk out to the streets and crowds flock to these places. Once I had lunch with a Vietnamese friend who wanted me to try out a specific duck restaurant. It was so popular, they had to place tables on the road and because it was hot, the fans got road space as well. Luckily, their two places are across the road from each other. The motorbikes and cars just go around slowly. After lunch, they hose down the kitchen, the sidewalk and the road and it's all as good as new. The duck was so good, I had to bring another order for Grumpy. 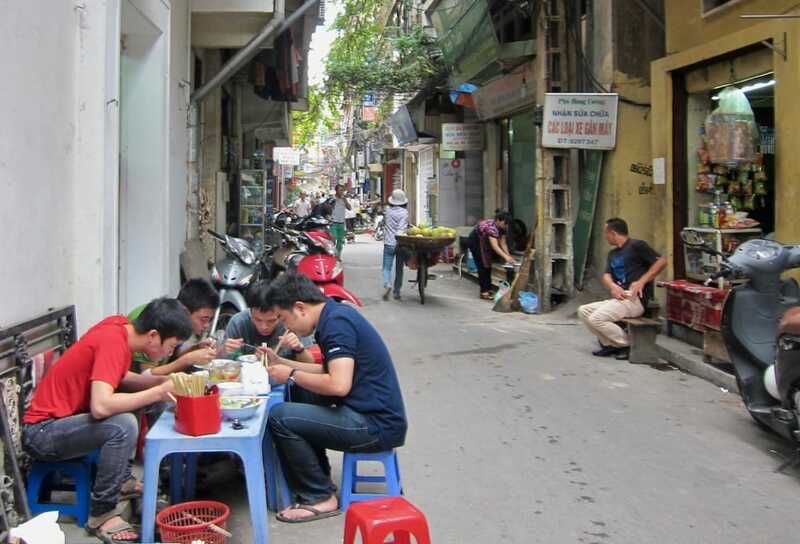 Yes, some foreigners are wary of trying Hanoi street food because of the miniature seating arrangements. They often wonder if these little plastic props will ever hold them. After weeks of just looking, Grumpy took courage and sat on one. It held him and he has since become a street food cheer leader. Hanoi is Vietnam's capital city. A northern city, it can be cold during the months of December to February. Some of the best street food is here in Hanoi. Street vendors are all over the city. Street food is all over Hanoi. As you walk along the streets and you find something that is not too foreign for your taste, try it. Start with this and try another one until you get used to it. 1. Bun Cha. That's the one you see the Lady is preparing in the picture. 3. Bun Moc. Noodles but what makes this different are the shredded young bamboo shoots. I bet you not many of you have eaten bamboo shoots before. 4. Bun Bo Nam Bo. Again noodles cooked differently with nuts and flakes. 5. Cha Ca La Vong. Eat this one in the restaurant with the same name. Not fancy. They only serve this dish of tiny slices of fish fried in dill and you eat it with noodles, peanuts and greens. 6. Bahn Cuon. Rice noodle-dumpling served with fried onions, dried shrimps and coriander. 8. Bahn Mi. Baguette sandwich with pork belly and other Vietnamese filling. 9. Ban Xeo. Egg pancake with sprouts and greens inside. 10. 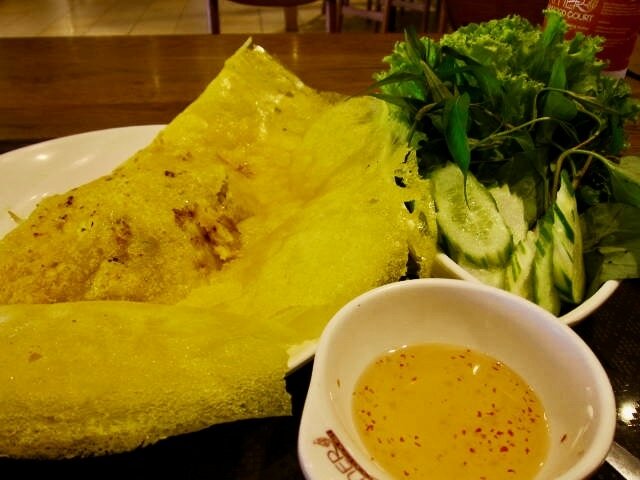 Banh Ran or Bahn Cam to top your food experience. Sticky rice flour balls. Hanoi street food is healthy when you eat it the way the locals do which is with mounds of fresh greens, leaves I can't even name, and herbs the smell of which fill you with aroma and taste that stays on in your memory. 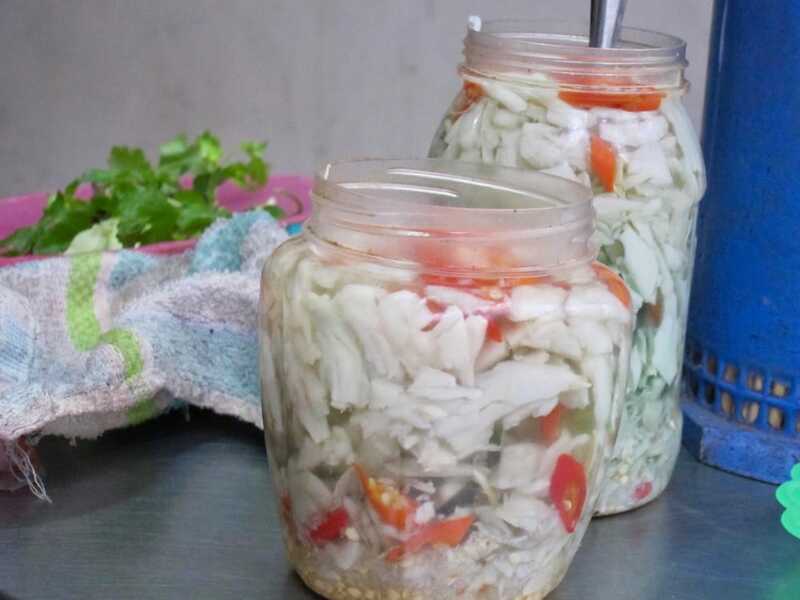 When I was new in Vietnam, there was an aromatic taste to many of the food that I have not tasted before so I went on a search for one of the best leaves. It turned out to be a local variety of sage. So, don't hesitate to try something new. Ask around and get to know your favourites. One actually gets to know the real flavours of a place through its street food. I was lucky to have a Vietnamese friend who brought me to new places each time we went out. Once, this friend and I went to the place selling snail dishes and arrived there at about 11:30 a.m. The sidewalk tables and stools were all taken. Luckily, there were 2 stools right in front where the owner was ladling the soup and so we got ourselves seated and the food started to come. First, we had spring rolls with snails, a bowl of greens which included finely shredded banana stalks (the inside part). Then, snail soup in a bowl was passed on. The soup had tofu and young green bananas complete with skin. More sauce came. Then, a cake which had snails as well. It had lots of vegetables mixed with it. All these dishes were new to me and my palette delighted in all of them. Salty and vinegary sweet, these pickles are just the right accompaniment to the pork. Placed in this bowl of sauce, often fish sauce with water and chili, the pork is eaten with noodles and lots of greens further flavoured with papaya pickles. 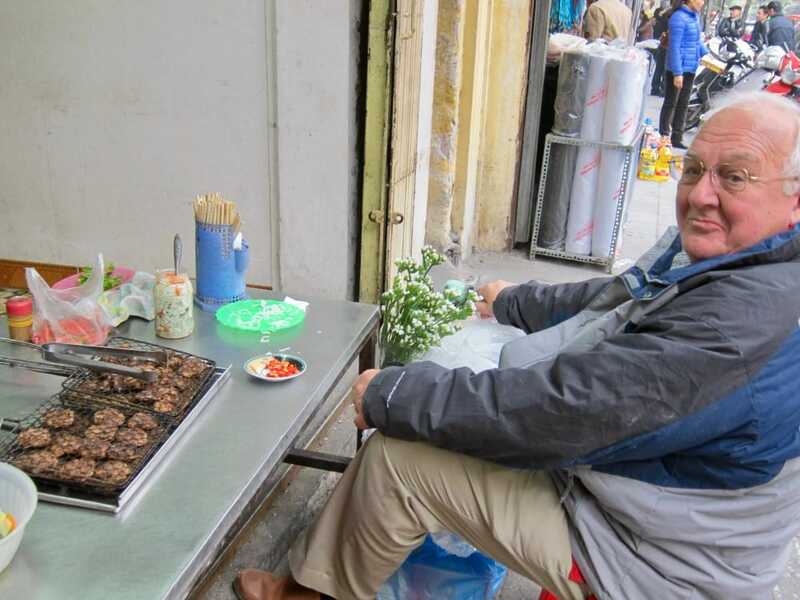 Vietnamese street food has captivated many foreigners. They have collected some of the most popular street food recipes and spiced these with stories of the people who run these stalls. 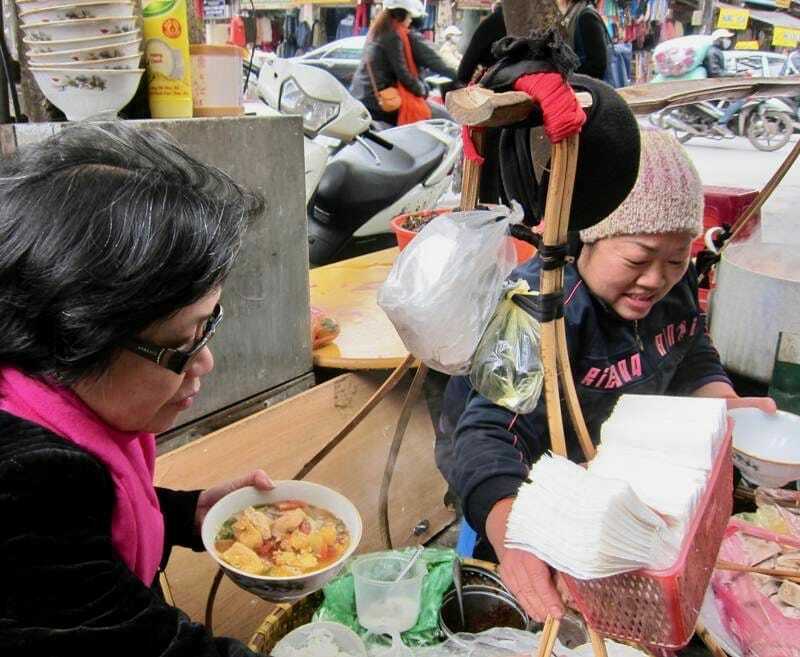 Have you tried Hanoi Street food? Share with us in the Comments below your own experience.